Cisco announced its entry in the tablet arena one year ago today at Cisco Live 2010. Today, it announced the AppHQ app store, and divulged some new details on the pricing and availability of the Cius tablet. Cisco decided to follow in the footsteps of the BlackBerry PlayBook and the original Galaxy Tab, and go with the smaller 7-inch form factor. The Cius breaks with standard tablet architecture by running on a 1.6GHz Intel Atom CPU rather than an ARM processor. The Cisco Cius tablet will be available July 31 for $750. The Cius has 1GB of RAM, and 32GB of internal storage capacity. It is equipped with front and rear cameras, Wi-Fi, 3G / 4G wireless connectivity, and Bluetooth 3.0. It also has a micro SD memory card slot, micro USB connector, HDMI, and headphone jack, and there is an optional docking station that supports full USB, Gigabit Ethernet, and an external display. One of the most unique--and arguably most compelling--features of the Cius for some users will be the presence of a detachable battery so that a spare can be swapped in when power is running low. The Cisco Cius is built for business like no other tablet. The RIM BlackBerry PlayBook also attempts to separate itself from the avalanche of consumer tablet options, but Cisco seems better positioned to deliver on that promise for a few reasons. One thing working in Cisco's favor is that Cisco has a much broader and deeper integration into the infrastructure at more customers than RIM, and the Cius tablet is designed to work seamlessly with other Cisco tools and services. The Cius tablet has built-in Jabber instant messaging, and one-click access to WebEx meetings. The 720p HD video of the Cisco tablet works well with Cisco TelePresence to enable video conferencing as simple as placing a phone call. Because it is built by Cisco, it is optimized to work with Cisco Compatible Extensions and connect smoothly with a Cisco Wireless LAN, and it includes the Cisco AnyConnect Secure Mobility Client for secure VPN connections. The AppHQ app store announced today. The AppHQ Manager gives IT admins power to control which apps are available to users--restricting access by user or device. The AppHQ storefront can be branded and customized, and the apps available in AppHQ are tested and validated so customers can trust that the apps will work as expected and not contain malware, and IT admins can add any of the 200,000 plus apps from the Android Marketplace to the AppHQ for users to have access to. 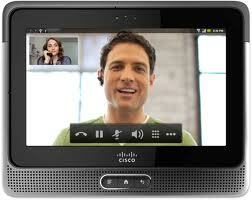 Cisco revealed that the Cius will be available as of July 31 for $750. With rebates or volume discounts, the tablets could cost closer to $650. The pricing--at least the discounted pricing--seems reasonable compared to the $600 32GB BlackBerry PlayBook which does not have 3G / 4G connectivity. As a business-focused tablet, built uniquely for a business infrastructure, the Cisco Cius may be able to carve out a niche for itself.